The Stone Harbor Property Owners Association (SHPOA) Beach and Bay Committee’s Annual Work Plan identified the need to have a report, which would review the successes and lessons learned from the recently completed Bay Dredging Project. The report was presented to the Borough December 15,2017 to be used as a reference for the Borough to help guide and improve future Bay Dredging Projects. Dredging of the SH Basins and Bays is a maintenance activity and needs to be financed and scheduled on a regular and routine basis. Just like the sweeping of streets and replenishment of sand on the beach, funding should be identified in the “pay as you go” operating budget of SH and accumulated in a dedicated fund earmarked for dredging activities. Use of debt financing (bonds) for maintenance activities is not appropriate or sustainable for our Borough. Dredging is crucial to the efficient outflow of tides and transport of storm water and to the vitality of water transport and boating recreation. Monitoring of sediment infill data identifies where and how often dredging should be scheduled. Research by the Stockton University’s Coastal Resource Center, the Wetlands Institute and others should be utilized to schedule dredging. Waiting every ten years to dredge is too long a cycle and creates dredge quantities that are expensive and difficult to dispose of and limits effective hydraulic performance of the Basin & Bays. The Bay Dredging Project started in the fall of 2015 and was completed in May 2017. It was a multi-phase project performed by the contractor, Sevenson Environmental Services. The contractor was forced to change the method used for dewatering the dredged material and ultimately the method of dredging in Phase 1. Despite these setbacks, the project was essentially completed on time. Reports to date indicate that the project was completed under the $11 MM budget. This may be due to improved efficiency of the changed methods or primarily because there was less cubic yards of dredge material needed to be removed than originally projected (86,074 vs. 102,940 cubic yards). Most importantly, the dredging elevation goals were achieved and verified by surveying and sonic readings. The contractor should be commended for consistent communication with the Borough including weekly electronic updates which were available on the borough website. An additional benefit of the bay dredging was that a small amount of de-watered sand from the dredge material was recycled to the Stone Harbor beaches in phase 1 of the project. Although not limited to this bay-dredging project, the recent bay-dredging project was not budgeted as an operating expense by the Borough and money was borrowed to fund the work. The project was financed by bonds which is a financing option most commonly used for the financing of capital assets having a long useful life commensurate with the financing term. This will be discussed further in the recommendations section and justifies the need for a long term Borough financing plan. An unfortunate result of the entire bay dredging process was the thousands of heavy truckloads that hauled material (sand and cement) on to and off the island. The trucks overloaded Borough streets and bridges and may have contributed to the 96th street bridge failure. Asphalt, underground utilities, air quality, and noise were all negatively impacted. This was a result of the amount of dredged material and no local regional disposal site. Before the next dredging, this entire process should be reviewed for efficiency, cost containment, and practicality. The need to turn the marina areas into an industrial worksite was necessary but unfortunate. Homeowners in SH and Avalon living in the area were subject to noise, dust and unsightly operations. Before the next dredging operation SH should join with Avalon in using their regional disposal site. This could reduce cost and on island dewatering operations. The bay dredging process also caused a considerable amount of frustration for residents living on the bay that needed to have private dock areas dredged. The contractor provided individual quotes for residents based on area and amount of dredged material. However, the cost per yard quoted varied greatly, appeared inconsistent and arbitrary rather than utilizing a consistent per unit cost for dredge removal. Some residents who were interested in having their dock area dredged did not because of the excessively high quote. The cost to remove a cubic yard of dredged material around private bulkheads and docks should be included in the bid sheet the next time the Borough bids a dredge project. The cost would still be the responsibility of the homeowners but the contractor would be bound to a publicly disclosed unit price. First, bay dredging should occur every 3 – 5 years based on sediment infill monitoring. Basins could be rotated and bay areas scheduled so that dredged material can be kept at quantities that can be locally disposed. This will serve to accomplish several goals and avoid some of “what didn’t work”. With smaller quantities of dredge material, options exist to work with Avalon to utilize their regional dredge waste site. SH should look at purchasing a site off island. This will eliminate the need for de-watering the dredge material and not treating and hauling on the island. 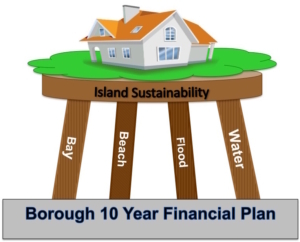 Secondly, it is imperative to include the every 3-5 year bay dredging in the ten-year financial plan of the borough. The bay dredging is a maintenance activity not a long-term project and should be budgeted by setting aside funds for the expense of dredging every 3-5 years. Dredging should be not financed with long-term bonds of any length of time. The borough also has the opportunity to more closely monitor bay infill rates published by the Stockton University. SHPOA Beach and Bay committee can offers its assistance in this ongoing process. Finally, more public outreach and education the year before a scheduled dredging operation should be included in the routine dredging schedule. Over the past two years, Stone Harbor Property Owners Association (SHPOA) Beach and Bay Committee has shared with Association members its Work Plan for ensuring the sustainability of Seven Mile Island. At the June and September General SHPOA Members meetings, the committee reviewed the “four legs the stool” that comprise the underpinnings of the SHPOA sustainability program. Fundamental to success in dealing with these components is the Borough’s development of a Ten-year Finance Plan, which would identify sources of funding for what could potentially require one hundred million dollars of investment. “Sustainability” has been defined as a requirement of our generation to manage the resource base such that the average quality of life that we expect is shared by all future generations. Perhaps more simply put, sustainability is the obligation each generation has to future generations to pass along the resources of our community, state, nation and the world as best we can so that future generations are able to enjoy the world, as we now know it. Stone Harbor has reached a point in its history where rising ocean levels, land subsidence, groundwater extraction and local flooding require strategic management. Over the past ten years, we have experienced increased flood events in Avalon and Stone Harbor. In fact, from 2016 to 2017, flood events increased in frequency from 17 to 23. There are several reasons for this increase in flood events. One is the fact that the ocean levels are rising. In the past ten years, the ocean waters around Seven-Mile Island have risen six to eight inches according to the National Geographic Survey. Stone Harbor’s storm drainage system is the centerpiece of its Island Flood Management Planning. The current system is undersized, requires upgrades and may have to transition from a gravity flow system to a pumped system. In short, significant future investment is needed to keep the Island from flooding after rainfall and tidal events. Another cause of flooding in Stone Harbor is the height of the bulkheads on the bay side of the Borough. It has been estimated that the bulkheads need to be raised in height by 2 to 4 feet to prevent flooding. This includes both private and publicly owned bulkheads. These shortcomings are of major concern and need to be addressed by knowledgeable professionals who have specific, proven, and successful experience in dealing with such matters. The cost to upgrade our storm drains and bulkhead infrastructure could reach $50 million dollars. The Borough is preparing a Flood Management Plan, which SHPOA will closely monitor, and review. A detailed comment letter was prepared by the Beach and Bay Committee and was sent to the Borough four months ago. Seven Mile Island experiences significant storms and tidal events throughout the year. Nor’easters occur periodically and frequently result in significant loss of sand and cause damage to the beaches. Replenishing the sand, that is, renourishment of the beaches, has become a regular, on-going maintenance activity. Because renourishment is recurring process, the Borough must allocate annual budget dollars for the work that needs to be done to repair and replenish the beaches. Borrowing money to purchase sand that wears away in one or two years is not a viable approach to dealing with renourishment funding. Those who attended the presentation at the Harbor Square Theatre in September may recall the visual presentation showing the Stone Harbor beachfront in 1992 and compared with the present-day beachfront, now twenty-five years later. Fortifying the dunes was a necessary and positive action that has clearly protected our beaches from damage during hurricanes and Nor’easters. Maintaining the sand profile of our beaches is necessary for both recreation and protection. Bay dredging and maintenance efforts must be addressed by the Borough more frequently than every 10 years, as has been the case. In essence, it is important to recognize dredging as an on-going and necessary maintenance event. Studies by Stockton University Coastal Research Center, the Wetlands Institute and other agencies can help Stone Harbor pinpoint the frequency (3-5 years) for doing routine dredging. This dredging plan requires an annual budgeting of funds to allow this work to proceed. Borrowing money to perform maintenance work such as dredging is not sustainable. Dredging only every 10 years results in having to process very large quantities of dredging material (spoils) and in incurring significant costs that can be avoided if the dredging is done more frequently in smaller operations. Recognizing that the water supply for a barrier island such as Seven Mile Island is not unlimited, usage will have a dramatic effect on the island’s sustainability. Seawater intrusion and land subsidence are results of overuse of the aquifer. Water usage is a function of the residential landscape practices, the watering schedules of property owners and the Borough, zoning ordinances, housing standards, and residents’ water use practices. SHPOA is preparing a report on Borough water use trends and practices with recommendations for change. Update your toilets: Install low flow or high efficiency toilets. This saves both water and money. Change your showerheads: Install low flow showerheads. This saves water and money. Plant sensibly: Switch landscaping and household plants to low water usage, native or drought-tolerant species. A list of native plants can be found on the website banner above. Water in the morning or evening to reduce the chances of evaporation. Properly maintain your irrigation system: Have your system audited by a certified WaterSense professional. This can reduce usage by 7,600 gallons per year according to the EPA. Fix water leaks immediately: A leak can use up to 180 gallons of water a week. Shut off water while brushing your teeth. Showers should take no longer than five minutes. Shut off water between shaving strokes. The northeast coast of the US, and specifically barrier islands, is sinking and the Atlantic Ocean is rising. Redevelopment in the Borough has changed water usage and drainage characteristics. Newly constructed houses on the island are dramatically larger than the ones they replace. Extraction of groundwater has increased as a result of larger homes, swimming pools, and installation of lawns and non-native plantings. Saltwater intrusion into the aquifer from overuse resulted in Cape May and Wildwood to seek a desalination solution. A federal and state study identified water supply issues in 2010. It is now time to attack the problem. The Flood Management Plan needs to address a 10 to 25-year time span. Beach renourishment, basin and bay dredging, and water conservation must be included in the Borough’s annual budgeting process. A 10-year Financial Plan must anticipate the investment needed for these programs. Total cost could be $100 million in private and public investment. The stakeholders of Avalon and Stone Harbor must become more aware of the wider range of sustainability issues affecting our island. This is more than just the matter of water conservation and scheduling days for watering lawns. We must address beach nourishment, bay dredging and maintenance, flood management, and water usage. Addressing these issues necessarily involves how these needed improvements will be financed. These matters need to be addressed in the annual and long-term budgeting process. More than a general awareness, we need to become more actively informed and involved in order to understand the urgency and we need to commit ourselves to taking action to resolve these problems now. 1885 – We were taking our walk on the beach on a beautiful summer day, and in the distance we could see the waves breaking on the sand bars in Herford Inlet. The Point was just beginning to come into view. And then we started our climb walking in the soft sand up one of the highest sand dunes along the beach. As we climbed we could see the Wax Myrtle and Juniper Bushes crowding the top of the far side of the dune. Here and there a Holly Tree was growing, its red berries, and waxy leaves were glistening in the sun. Near a small fresh water pond a stand of Eastern Red Cedar trees, their needles whispering, were bending to the wind. When we reached the top of the dune we looked out to sea and saw a three masted schooner, her white sails filled with the wind, and her blue bow spraying white caps over the surface of the blue green sea. She was on her way into Herford Inlet. We could almost hear the Officer of the Deck call to the helmsman,“ easy now, easy now, steady as she goes,” as she eased her way through the inlet channel to take the back channel behind The Wildwoods down to Cape May Harbor. 1888 – The wind was blowing hard, and the rain was stinging our faces as we walked down the beach toward The Point in a nasty northeastern storm. We decided to get out of the house and take a walk to get some exercise even though it was storming outside. Just a few blocks from The Point we stopped for a moment to look at the huge waves that were breaking out at sea. As we looked we noticed a coastwise schooner about three miles out her mainsail ripped down the center and her main mast leaning at a 30 degree angle swaying in the wind. She was struggling to make headway against the wind and the massive waves. She was in trouble. And then we saw the life boat, the crew rowing furiously through the massive waves pulling lines across the beach and through the crashing surf out to the schooner to rescue her crew. It’s hard to remember now and even harder to believe that through the late 1800’s and early 1900’s hundreds of vessels sank off the New Jersey coast. Being a member of a life saving crew was a very serious business, and those brave crewmen of those times saved thousands of lives. 1934 – Many of the sand dunes along the beach during the years of the past were 15 to 20 feet high. These dunes separated the beach from the town and helped to protect the homes that were built within the beach block when the violent Northeasters stormed ashore. It was lots of fun to run up and down those high dunes. Later in the day we would try to catch one of the hundreds of sand crabs that lived in the soft sand at the base of the dunes. They would come out of their holes by the dozens in late afternoon and early evening and scurry over the sand looking for something to eat. Or maybe they were looking for a new mate? About two weeks later when we were exploring more dunes a few drops of rain began to fall. We looked up at the sky and noticed some storm clouds gathering. And when we looked out to sea we saw a line of huge dark purple clouds rushing along the horizon. An angry storm was beginning to form. The storm became a violent Northeaster that smashed across the island’s beaches, so powerful that the ocean met the bay at 83rd Street. We remember standing in the middle of 83rd Street in ocean water up to our waists looking back toward the bay and seeing the street covered with water all the way to the Great Channel. The beach was scoured into ‘gullies’ by the huge breaking waves as they returned to the ocean when the tide went out. After the storm a forty foot white cabin cruiser with its red cedar hull lay on its side on the beach near 85th Street. The boat washed ashore in the storm with four drunken fisherman aboard. The fisherman said they thought they were going to drown at sea, so they drank beer and got drunk. We often wondered had they really gone fishing or were they on a beer drinking cruise? 1941 – Our country was at war with Germany. Stone Harbor braced for the change in resort life that was surely to come. Street lights shaded on the ocean side, cars’ headlights reduced in light volume to the size of a pool ball. The beach was off limits at night and patrolled by helmeted rifle carrying army and coast guard troops. The generally dimmed lights of the town conveyed a somber mood. 1943 – There was a beautiful orange moon shining that September night, and it was casting its light over the rising swells of the ocean lighting up the beach with a pale orange glow. My high school girl friend and I were taking a walk on the beach around 110th Street. I was in my navy uniform, and we did not know that the beach was ‘off limits’ at night. Suddenly, a shout came from up the beach, and three helmeted coast guardsmen came into view with their rifles drawn and pointed at us and ordered us off the beach. I started to explain that I was in the navy when the order turned into a command. The resort beach was now a war beach. 1944 – On Thursday, September 14th The Great Atlantic Hurricane was being tracked 40 miles off the beach of Stone Harbor. At 5 O’ Clock that evening the storm smashed ashore with winds gusting to 80 to 100 miles per hour. The first waves estimated to be 30 to 50 feet high crashed into the boardwalk and the ocean front houses and rushed over the streets causing immediate catastrophic damage. Many of the ocean front houses were immediately destroyed. The Public Fishing pier was swept away, and the boardwalk and its stores and pavilions were completely destroyed. The Nautilus apartments and the Breakers apartments built along the boardwalk were decimated. A huge section of the beach bulkhead was shattered and the dunes were leveled or swept away. The boardwalk was never rebuilt. It took a number of years to rebuild the beach bulkhead and many years for the sand dunes to return. But those high majestic sand dunes of the 1930s’ have never returned. Stone Harbor’s beach was changed forever by that powerful storm. Some would say it was good because we no longer have a boardwalk. Some would say it was a tragedy because we lost our high dunes. But the nostalgia of standing on a 20 foot high dune and looking out to sea watching a 3 masted schooner easing her way into Herford Inlet is gone forever. 1947- John Roberson and I had just finished our life guard duty for the day, and along with John’s brother we were walking up the beach to 80th street to play some ‘touch football. All of the guards had left the 83rd Street beach. Suddenly, as we were walking, a frantic young girl rushed up to us and said there was a father and his three children who had gotten caught in a ‘washout current,’ and they were now out beyond the breakers trying to swim back to the beach. We looked out to sea and saw them struggling way out beyond the breakers. My two friends, bigger and stronger swimmers than I, immediately ran into the surf and started swimming out to the family. They held them up while I ran back to our beach and got a couple of guards who were still there and we quickly rowed our life boat out to them and got everyone into the boat. There is no question in my mind, had it not been for my two friends who held these people up until we got them into the boat, they would have drowned. I don’t believe this true story was ever published in any paper or known by many people. I’m proud of what we did that day many years ago. Our historic walk on Stone Harbor’s beach has now come to an end. This writer would like the reader to know that all of the events that took place during our historic walk are true and authentic. In the first two incidences, a story was written around the event from factual information gathered from research. However, the event itself actually took place and is historically authentic. In all of the other happenings, the writer was actually involved and participated in the experience personally. There are many more true stories and much more history that could be written about this amazing, enchanting beach. But those stories will have to be written at another time by another writer. A quiet magic happens in the morning. Shortly before 5 am I walk to the car in the deep blue, pre-dawn light. There are no cars passing on Second Avenue. The only sound I can hear is from the bay… a distant low squawking, like a far away train.When I get to the dock the pilings are dark and damp and the still water of the bay reflects a blue/black sky. I greet Terry, the captain, and Bill Dougherty and Lew Ferguson. We climb into the boat quietly, unhook the lines, and with a low rumble we slide out into the channel as flat and reflective as a mirror. It is quiet except for the background sound of a million birds starting their day. Sunrise is still 30 minutes away. We are almost alone on the water. There is a small skiff with three people fishing but it is half a mile away near the free bridge. We pull into the channel behind Nummy Island and as we approach the marker we see it houses a nest for a pair of osprey. We can see their sharp raptor eyes as they watch us approach. When we get close they flex those powerful wings once and glide away. We have come close to two of the lords of the salt marsh and I feel honored by their presence. Terry cuts back on the rumble of the engine and finds a narrow channel right up against the bank and the song of the water fowl grows louder. On the beach we are used to the sounds of individual gull cawing. But this is like a world cup stadium, thousands of water bird voices melding to a single roar that is all around us. Are they talking about us? I think not. They have their own eternal game going and we are just passing oddities. We glide along the bank and come to a small lawn with a score of Sanderlings praising the sun. They are quiet and still and ignore us as we glide by. Overhead the sky has lightened to blue and pink and gulls and osprey wheel and glide but down on their little lawn the Sanderlings pay attention to what matters. Their eyes are steady on the rising sun. We drift past and above the steady song of the birds I hear the click of Lew and Bill’s cameras. I love my sleep and mostly I want to greet the sun when it is well up in the sky. But when I do force myself out of bed I am always rewarded. If you are a photographer, this is called “the Magic Hour” but even if you leave the camera home you will find magic in the morning. We had use of Terry’s boat, but I can recommend three places to greet the sunrise without a boat. First, The Wetlands Institute doesn’t open at dawn, but you can park in their lot and walk down the path nearly half a mile to their pier. In the pre dawn light you will be surrounded by a primal world and its song will fill your ears the way it did for Dutch sailors nearly 400 years ago when King Nummy was a young man. Second, the Point. Drive to 123rd street, park the car and head for the beach, but before you get there turn right and walk down the shell path to the observation deck built on top of a dune. It is a wonderful place to watch the sunrise and listen to the gulls. Third. Drive out the causeway and turn left on Bayberry Dr. before the parkway and head down to Shell Bay. There is a little park and a fishing pier that takes you out into the vast Jenkins Sound. You will be in the midst of a world that is old and wonderful. Enjoy the magic. If you were ever on a dock on a basin or on a dock on the back channel you may have noticed a pile of mussel shells on the deck of the far corner of the dock. Did you wonder where those shells came from? Did you notice the cat-like five toe prints that surrounded the shell pile and led back to the far edge of the dock? If you noticed these clues you saw the evidence of a visit from our ‘Wetland’s Whiskered Secret’. This mysterious whiskered night stalker is a resident of the wetlands, and the wetland waters, and is rarely seen by most of us in our community. This whiskered sleuth is never far from us, and our waters. Our visitor is a semi aquatic mammal that loves to play, hunt, and fish in marshes, sloughs, ponds and streams. Indeed, these marshes and various other bodies of water are its home. Our whiskered mammal thrives in primarily fresh water, while its cousin thrives in saltwater. Both can tolerate extensive temperature changes and various land elevations. Of course, our wetlands whiskered secret is a river otter that lives in brackish and freshwater. The river otter is part of the weasel family and is also a distant cousin of the sea otter. Our otters live in a ‘holt’ or ‘den’ often constructed in the ‘Fast Land’ of the wetlands, and around and under docks. Otters are very opportunistic, and sometimes occupy the abandoned burrows of other animals such as foxes, woodchucks and ground hogs located on the edge of the mainland side of the wetlands. The entrances to otter dens are often under water, but can also be above ground. A tunnel leads to a chamber in their den that is lined with leaves, grass, bark and hair, creating a nest for their kits. These adorable critters are family oriented and extremely nimble as they play together sliding down mud slides and tumbling over each other in the channels and back waters of the wetlands. They have been seen swimming in Muddy Hole Creek just next to Muddy Hole Island, and at Sedge Island where they have been known to swim across Stone Harbor Hole Channel, where their paw tracks in the sand at the side of Third Avenue reveal their journey to the Bird Sanctuary to feed. They are highly intelligent predators and feed on fish, crustaceans, mollusks, oysters, shellfish, crabs, crayfish, and other slow swimming aquatic animals such as frogs, turtles, rodents, and even insects and birds. A number of years ago early in the morning at the Stone Harbor Marina we caught an otter in the beam of our flashlight reaching his paw through the hatch he had opened into our live minnie bucket, catching a bunker that he was struggling to remove through the hatch. When he saw us he gave a couple of throaty grunts, and quickly flipped himself back into the water near our boat slip. Some of our friends that live on the Great Channel have gotten nightly visits from otters that have left their ‘Calling Cards’ on their floating docks. Our otters are hard to see but they are with us. In the past river otters populated nearly every river in New Jersey. They were hunted and trapped almost to extinction, and are now threatened by habitat destruction; climate change because it threatens their aquatic food source, depleted forest land because it threatens their cover and protection, reduced vegetation because it threatens their land source for food, and depleted water quality because of pollution. Remember, water is their life and their substance. We don’t want to lose our ‘Wetlands Whiskered Secret’ ! The Stone Harbor Bird Sanctuary is an island refuge in a sea of development. It is a remarkable place where a short stroll can transport you to another place and time. The Egret Espy trail meanders through the ancient maritime forest, providing cool shade, wild sculptured trees and the sounds of a hidden paradise. Teeming with life, the Stone Harbor Bird Sanctuary is aptly named – it is a sanctuary for people as well as wildlife. Migratory and resident birds are frantically feeding in the canopy and forest floor, or are busy building nests. The marsh and wetlands are alive with the calls of frogs and toads. Turtles are meandering through the woods at their own leisurely pace. Moths, butterflies, and dragonflies are just arriving in the sanctuary or are just hatching or metamorphosing. Some are settled into their homes at the sanctuary, while others are only here for a few weeks in May and early June resting and refueling on their journeys to nesting grounds further north. The gardens at the Sanctuary have been carefully designed to provide an array of services for the resident and migratory critters that use this refuge. Sanctuary gardens were designed and created initially as part of the sanctuary restoration project undertaken by the Stone Harbor Bird Sanctuary Committee and the Borough of Stone Harbor. Since then, some of the gardens have needed updating and maintenance. Beginning last spring, the Sanctuary Committee, Wetlands Institute, and Borough set upon a course to revitalize and renovate the gardens. We started with the gardens around the Egret Espy path on 2nd ave and will focus effort this spring on the gardens around the pumphouse on 3rd ave. The overarching plan for the Sanctuary gardens is to restore the gardens using only native plants that, once established, will require little to no watering. The plant selections and garden composition place an emphasis on providing critical needs to songbirds, hummingbirds, butterflies, and pollinators. For butterflies, the plant selections provide for the spectrum of their needs from host plants for caterpillars to eat, to nectar sources for feeding adults throughout the summer. A special emphasis has been placed on nectar availability for Monarch butterflies that migrate through Stone Harbor in October each year. Pollinators – think bees of all types – are in serious decline and desperately need some help. A combination of genetically modified plants with built in insecticides to the extensive use of insecticides, to climate change, and disease – are all taking their toll. The result is a significant decline in pollinators – especially the honey bee. Pollinators are the silent heroes among us. Their role pollinating plants – especially food crops is critical. Providing native plants that bloom throughout the season contributes to the well-being of our native bees. When you pass a sanctuary garden with flowers covered by bees – a fist pump of joy should be the response! The gardens are beginning to green and soon will be ablaze in color. A walk around the Sanctuary and self-guided tour of the gardens provides visitors with information about creating important wildlife feeding stations in their own yards and an opportunity to enjoy the wildlife that benefit from the Sanctuary. Every year in late October or early November Stone Harbor welcomes thousands of its feathery winter visitors, the Atlantic Brant. The Atlantic Brant is similar in configuration to its cousin, the Canada Goose, but is much smaller in stature, weighing about three pounds. The Brant’s head, neck, bill, and feet are black. The bird’s back is dark brown, and its breast is white-gray. The mature Atlantic Brant may be identified by the ring of white feathers it has around its neck. Atlantic Brant mate for life and begin breeding when they are about three years old. During their breeding season, the Atlantic Brant are located from the Canadian Arctic to North of the Barents Sea. Major breeding colonies can be seen at the Arctic Foxe Basin west of Baffin Island. One of the most important spring staging areas is James Bay. The snow melts around the middle of June in these Arctic lands, and the winter snows return in early September. This moderate weather period leaves just enough time for the Brant to lay clutches of 4 to 6 eggs in rounded depressions in the ground lined with down feathers, and raise their new born goslings to be able to fly. The male Brant takes the lead, herding the young brood around while the female follows close behind. In late September and early October thousands of Atlantic Brant leave their Arctic breeding grounds to begin their long journey, flying to the East Coast of the United States. They fly over the Hudson Bay, the Saint Lawrence River, the Gulf of Saint Lawrence and over the estuaries of Maine, Massachusetts, New York, and New Jersey, stopping at times at the various bays and estuaries to rest and feed. The Atlantic Brant flies an astounding 7,000 miles to complete this journey. They are with us from late Fall to early Spring, sparkling our Wetlands back bays, tidal flats, and salt marshes with their black and white feeding activity as they feed on eelgrass, sea lettuce, and cord grass. Young Brant feed on invertebrates, mosquito larvae and various plants. The Atlantic Brant also feed on grass in fields, and cultivated lawn grass, especially in the New York and New Jersey areas. They get their fresh water from a unique gland in their bodies that allows them to drink salt water. Most of us do not know that the Atlantic Brant are hunted for sport. There are strict regulations in New York and New Jersey regarding the hunting of the Brant, and the hunting results are managed through the use of surveys to keep the Atlantic Brant population stable. During an average winter, 70% of the total Atlantic Brant population overwinters in New Jersey. We are delighted to have hundreds if not thousands of these amazing birds be our black and white, feathery, winter visitors. The Centennial of Stone Harbor provides a fitting backdrop to showcase the historical founding of The Wetlands Institute and the path it is now on. In 1969, Herbert Mills (1910-1972), then Executive Director of the World Wildlife Fund, founded The South Jersey Wetlands Institute to draw attention to the dramatic losses of wetlands and the threats that their loss posed to society. He devoted much of his life to conservation and embarked on a mission to create a wetland and coastal research station in southern New Jersey to study wetlands and create an ethic of stewardship. Under his direction, the World Wildlife Fund purchased 6,000 acres of wetlands and changed the history of the area forever. He then fulfilled his lifelong vision of creating a world-class research, conservation, and education center. His dream was to help people understand the importance that wetlands have for their health and well-being and he sought to inspire everyone to want to conserve and sustain them forever. This goal still underpins the mission of The Wetlands Institute and continues to guide research, conservation and education programs. Herb loved birds and nature all his life. He spent much of his life as an executive in the glass and canning industries of South Jersey. In 1960, he left the business world to devote his energy to conservation. He was member of National Audubon Society’s Board of Directors and in various leadership roles from 1957-1964. From 1965 – 1969, he served as Executive Director of World Wildlife Fund US. In 1968, he spearheaded a fund-raising campaign that made possible the acquisition of 6,000 acres of salt marsh extending from the barrier island to the mainland from Sea Isle to Grassy Sound. The South Jersey Wetlands Institute was incorporated in 1969. In 1970, the World Wildlife Fund deeded a tract of 34 acres including an area that was already filled where the Institute now sits and the road to Scotch Bonnet Creek that is now the Salt Marsh Trail. In 1971, the State of NJ purchased the remaining wetland acreage as part of the Green Acres Program, and it is managed as part of the coastal wetland preserve. Herb Mills was ahead of his time. Forty-five years ago, he pointed out the importance of maintaining natural systems to help coastal communities protect themselves against nature’s onslaughts, long before their value was understood. In a December 1968 speech to the World Wildlife Fund, in the aftermath of a colossal coastal storm, Herb recognized the importance that wetlands had for coastal resilience. “The alarming losses to our fishing economy, the declining catches of menhaden and other commercial and sport fish, and the pollution and silting caused by dredging, all point to the need for preserving these meadowlands and watercourses. Stone Harbor, Avalon and many of the coastal communities throughout New Jersey, were reminded of the value of wetlands in mitigating storm surges and flooding during Hurricane Sandy. Herb raised the funds for the design and construction of the main Institute building. The building was designed by Malcolm B. Wells, a world-renowned ecological architect, well before this was in vogue or popular. Designed with the flavor of an old US Coast Guard Station, the building’s exterior and roof are Atlantic White Cedar and the iconic tower provides unparalleled views of the marsh and is a welcoming sight to vacationers and travelers headed to Stone Harbor. Situated in an area of global significance for migratory birds and horseshoe crabs and with a natural laboratory spanning several thousand acres of unbroken wetlands, The Wetlands Institute is again poised to be a problem-solver and educator of complex issues that have both direct and indirect influence on coastal communities and economies in New Jersey and beyond. With renewed energy, focus, leadership, and passion, The Wetlands Institute has been repurposed and is moving research, education, and conservation programs to new heights. There is nothing more relaxing than watching these beautiful birds skim along the shoreline with their long graceful wings, snatching up food with its lower bill as it plows through the water. Unfortunately, the Black Skimmer is much less prevalent along our shores than in years past. One of their favorite natural nesting places was the beaches at the “Point.” With changing conditions at the “Point” over the last several years they have abandoned it as their nesting place. If you travel the back bays by boat, you can still see them searching for fish in the marshes with the gulls and other sea birds. But there are encouraging developments designed to improve the nesting habitats of the Black Skimmer, and other shore birds, as well as the Diamondback Terrapin. With funding from the Department of Interiors’ Sandy Recovery Fund, two new projects were initiated this year aimed at improving nesting sites for our shorebirds. Led by the New Jersey Department of Environmental Protection and other partners and in conjunction with the Army Corps of Engineers, the first project explores the beneficial use of dredge material for habitat creation by “Spray Dredging”. Using this technique they deposited a thin layer application of dredge material (sand) to an area of Ring Island behind the Wetlands Institute. This increased the level of the marsh bed in this area by at least 3 to 9 inches. The second project removed a larger amount of dredge material (sand) from the Great Channel and deposited it as nesting material in another area of Ring Island that raised the marsh bed approximately 4 to 6 feet above mean high tide. These projects will provide a new sand habitat for nesting birds. The work was conducted in August after the nesting season. Upon the return of the Black Skimmer and other birds next spring, the Wetlands Institute will monitor their nesting patterns in the two new sites to evaluate the success of these projects. One of the most beautiful birds that grace our shoreline and back bay salt marshes is the Black Skimmer. A large, lanky, longed winged bird with a distinctive red and dark tipped bill, it is swift and graceful in flight. It feeds by skimming along the surface and plowing its long lower bill through the water and snapping up small fish. It nests in colonies on protected dunes and beaches. They are very sensitive to disturbances during nesting season, so the presence of people, dogs, predators, and flooding from storms will cause them to abandon their nesting spots. 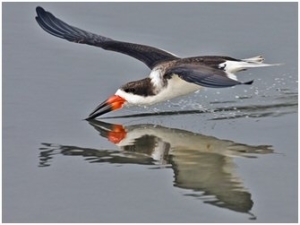 The Black Skimmer is classified as an Endangered Species by the state of New Jersey. Finally, another project, led by New Jersey Audubon and The Wetlands Institute, is underway to move sand from the intertidal areas near the “Point’ and redeposit this nesting substrate back on shore in order to raise the base level of the “Point” above the flood line. This should provide a new emergent sand habitat for the Black Skimmers to nest next season on the “Point”. With the success of this project, and the Ring Island projects, we should look forward to the beautiful Black Skimmers gracing our shoreline again next summer. Ring Island Project. Photo provided by The Wetlands Institute. I would like to thank Lisa Ferguson, PhD, Director of Research and Conservation at The Wetlands Institute, for her support and guidance in writing this article. Home to extensive recreational use, Cape May County’s ocean waters, beaches, marshes and backbays oftentimes become host to unnatural objects- marine debris. Marine debris, which refers to any human generated trash that enters into the marine environment (oceans, beaches, bays, and marshes), becomes prevalent within our local ecosystems during the summer months as approximately 800,000 people (locals and tourists) recreate in our area seasonally. Unfortunately, once marine debris enters into the marine environment, many debris items can persist for incredibly long periods of time. Cigarette butts can last 1-5 years; plastic bags, 10-20 years; aluminum cans, 80 – 200 years; plastic beverage bottles, 450 years, and how long glass bottles persist is unknown! The occurrence of these common items as marine debris has become more and more overwhelming. Marine debris not only lasts a long time in the environment, but its presence can cause additional disturbance to the health of many animals that inhabit our area. Debris can harm fish, dolphins, whales, turtles, birds, seals, sea lions, and people, too. It is often mistaken for food by marine animals – and plastics are impossible for animals to digest. Such ingestion accumulates in animal bodies over time and can eventually lead to illness or death. In fact, it has been found that fish in the North Pacific and Atlantic Oceans ingest over 10,000 tons of plastic each year and hundreds of thousands of seabirds ingest plastic annually. Debris causes further issue with entanglement as it can trap, injure and/or drown animals. Marine debris can constrict an entangled animal’s movement resulting in exhaustion or the development of an infection from deep wounds caused by tightening material. During an International Coastal Cleanup event held in 2008, 443 entangled animals were documented during that event alone. Human activities are also threatened as derelict traps and fishing gear may cause damage to boats and propellers, and divers and swimmers can become entangled in lines or ropes. Luckily, marine debris is preventable and anyone can make a difference through the use of simple actions. An important and effective way to help minimize marine debris is to prevent accidental loss of items. This can be accomplished by reducing the amount of disposable (e.g. bottle caps, straws, plastic bags, food/candy wrappers, storage containers) and easily-lost items taken outdoors. Such reduction can dramatically reduce the amount of litter that remains on the beach or is lost in waterways. You can also get involved in organized beach cleanups, like Clean Ocean Action’s Beach Sweeps co-led by The Wetlands Institute and Stone Harbor Property Owners Association on Stone Harbor beaches each spring and fall, or pick-up trash on your own when you are out on the water or walking along the shoreline. The Wetlands Institute in partnership with the Boat U.S. Foundation’s “Reel in and Recycle Program”, Cape May County Clean Communities, Stone Harbor Property Owners Association, Stone Harbor Public Works Department and other local businesses/municipalities/ towns have also worked hard to prevent a common form of marine debris in our area, monofilament fishing line, through the implementation of a monofilament recycling station program. 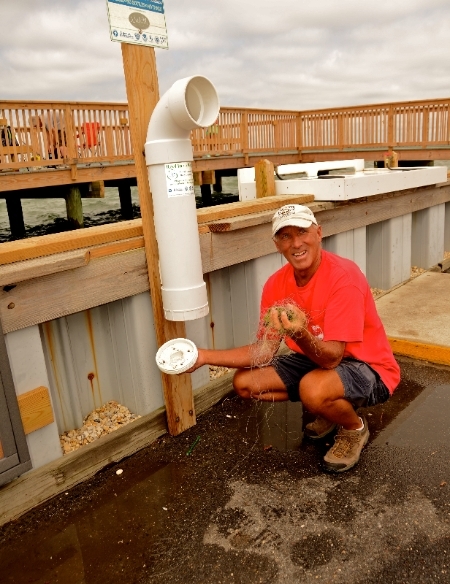 Joint efforts have installed more than 20 monofilament recycling stations at local marinas, fishing piers, and other fishing areas throughout Southern New Jersey- many can be found in Stone Harbor. Monofilament line thrown into the trash or environment can persist for over 600 years and cause many entanglement issues for humans and animals alike. The next time you need to dispose fishing line, be sure to utilize a recycling station. Properly disposed monofilament line can be recycled into raw plastic pellets that are used to make new plastic products such as park benches or tackle boxes. Through this program, the Wetlands Institute and partners hope to inspire anglers to be more responsible with fishing line disposal and to promote an understanding of how monofilament line can become a hazard when lost to the marine environment. Monofilament Recycling Station located at 83rd Street Fishing Pier, Stone Harbor, NJ. 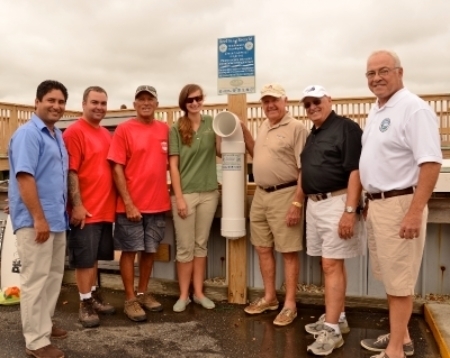 Collaborators from the Stone Harbor Property Owners Association, Stone Harbor Public Works Department, and The Wetlands Institute worked to install recycling stations throughout Stone Harbor. Left to right: Rocky Tirado, Tim Brophy, Mike Runyon, Katie Sellers, Bill Dougherty, Charlie Tomlinson, Terry Fortino. Despite many perceptions of a quiet winter season, The Wetlands Institute staff is still quite busy during the cold months. Although you might not see us outside working on barrier fencing or leading troops of students, we are hard at work on our computers planning and writing and then planning some more for the warmer weather activities to come. The Research and Conservation Department staff spends time applying for grants to garner funding for research projects, processing and analyzing data recorded during the summer, submitting permit requests, developing new projects with local partners, giving presentations at scientific conferences based on our research findings, and planning the details for our summer internship activities. The Education Department also writes and prepares grant submissions, applies for permits, develops new programming and curriculum, and plans for summer internship activities. Booking school field trip programs is a large component occurring in the background as department members are out teaching classroom-based travelling education and home school programming, along with hosting public programming activities at the Institute. The Institute is open to the public every Friday, Saturday, and Sunday during the winter season. We host covered dish dinners, lunch and learns, creature features, aquarium feedings, and seasonal science activities, and shopping in the Tidepool Shop. And soon spring will arrive with a new array of programs and events. If you are interested in learning more about the public programming happening at The Wetlands Institute, visit our website calendar for a complete schedule of activities. Did you know that The Wetlands Institute is working in cooperation with the Borough of Stone Harbor and the Stone Harbor Bird Sanctuary Committee to implement an invasive vegetation management and control plan for the Bird Sanctuary? This management plan will prioritize the removal of invasive plant growth in the Sanctuary to improve roosting and nesting habitat for colonial wading birds such as egrets and herons. Resident and migratory songbirds will also benefit from our habitat restoration activities. On Saturday November 2, 2013, The Wetlands Institute, Borough of Stone Harbor and the Stone Harbor Bird Sanctuary Committee held the first of many planned volunteer events designed to remove invasive vines from the Sanctuary. Volunteers made a significant impact as they removed a dumpster’s worth of invasive English Ivy and Japanese Honeysuckle from a section of the Sanctuary containing original maritime forest, a habitat highly valued by wildlife. Make sure to pay the Stone Harbor Bird Sanctuary a visit to see the improvements thus far. If you are interested in participating in future invasive species clean-up days. Excited anticipation is building for staff members at The Wetlands Institute as we await one of the most sought after New Jersey spring phenomenon- Horseshoe Crab spawning and shorebird migration season! With the impeccable timing only Mother Nature can create, many shorebird species including Red Knots, Ruddy Turnstones, Semipalmated Sandpipers, Sanderlings, and Dunlins time their migration from the shores of South America to the Arctic Tundra to coincide perfectly with Horseshoe Crab spawning season occurring along the Delaware Bay. Host to the densest concentration of breeding Horseshoe Crabs in the world, the shores of the Delaware Bay act as the prime location for many thousands of shorebirds to take a pit stop during what can be a 9,000 mile journey for some. The shorebirds not only stop to rest along the Delaware Bay, but also spend a majority of time feeding and refueling on protein-packed Horseshoe Crab eggs that are laid in nests along Bay beaches. During the months of May and June, the Delaware Bayshore beaches of New Jersey become packed with life as wildlife utilize most every inch of its shorelines for both breeding and feeding. Unfortunately threats to this incredible phenomenon do exist. The Horseshoe Crab population has declined by 90% over the last 15 years because of overharvesting and habitat degradation. Adding to these challenges, tens of thousands of crabs die each year after being overturned by waves or getting stuck behind bulkheads, rip-rap, or other hazards and becoming stranded on beaches. As the Horseshoe Crab population struggles, so do shorebird populations that are dependent on their eggs for survival. To help the many thousands of Horseshoe Crabs that accidentally become stranded on our local beaches every year, The Wetlands Institute along with the New Jersey Division of Fish and Wildlife, Celebrate Delaware Bay, and Conserve Wildlife Foundation of New Jersey have developed a reTURN the Favor program to rescue stranded Horseshoe Crabs. As a sanctioned program of the New Jersey Division of Fish and Wildlife, reTURN the Favor enables organized volunteer groups to rescue Horseshoe Crabs stranded on New Jersey’s seasonally closed and open beaches, while still complying with New Jersey laws and regulations which protect Horseshoe Crabs and shorebirds. Through careful protocols designed in conjunction with state officials, program participants act in accordance with New Jersey’s legislated moratorium on the harvest of Horseshoe Crabs and seasonal beach closures to allow migratory shorebirds to forage undisturbed. If you are interested in learning more about this program or are interested in participating in beach walks organized by The Wetlands Institute and other partner organizations (The Nature Conservancy, Friends of Cape May National Wildlife Refuge, New Jersey Audubon Society, Bayshore Center at Bivalve, and Citizens United to Protect the Maurice River and its Tributaries) to rescue stranded Horseshoe Crabs please visit the reTURN the Favor website (http://returnthefavornj.org/) to view when and where walks will occur. In the 2013 inaugural season, over 150 reTURN the Favor volunteers saved nearly 5,000 Horseshoe Crabs, in 43 rescue walks. Program partners are hoping to double these efforts in 2014, and have adopted 16 beaches for rescue walks. Join our reTURN the Favor effort to help us make a difference in a simple way! As you drive South through Stone Harbor on 3rd Avenue, and proceed over the “Free Bridge” on your way toward North Wildwood, the road bed on which you are driving is built on the wetlands of Nummy Island. Historical myth would have us believe that “Indian Chief Nummy” is buried on Nummy Island. In the north corner of the island where the back channels of Great Flat Thorofare and Dung Thorofare intersect is a large mound that looks like the remnant of an inactive volcano. This is a “Containment Structure” that was designed to hold dredging offal. It is now known as “Site 103”. In 1998 a consortium of Stone Harbor property owners formed a corporation which they named “The Stone Harbor Boat Owners Association Inc. During that same year the Association purchased 105 acre Nummy Island from the Estate of Standish Forde Hansell and created a containment structure on 3.75 acres on the north side of the Island. In 2014 the Borough of Stone Harbor purchased Nummy Island from “The Stone Harbor Boat Owners Association Inc.” This containment structure, “Site 103”, was built to comply with all State and Federal regulations and holds the offal that develops from the required periodic dredging of Stone Harbor’s Basins, Back Channels, and the Intra Coastal Channel that flows behind the town. State and Federal regulations require that all offal, or dredging sands and debris, dredged from Stone Harbor’s Basins, Back Channels, and the Intra Coastal Waterway behind Stone Harbor must be contained and stored in an accepted deposit area. Periodic dredging of these waterways and channels is absolutely necessary to ensure and maintain the proper water depth for public and commercial boater safety. Major dredging of Stone Harbor’s Basins, Back Channels, and the Intra Coastal Channel behind Stone Harbor took place some eight years ago. Over 150,000 cubic yards of offal was removed from the channels in and around the town. Because of hurricane Sandy, and the natural flow of the ocean sands and the general water debris from tidal currents, the channel waters in and around Stone Harbor must soon be dredged again. But, dredging is not the problem. After the offal from the dredging is pumped into and stored in Site 103, dispersing it in a “cost sensitive manner” from Site 103 for other uses is a daunting problem. The Borough Council of Stone Harbor has been working on the distribution of this dredging offal for a number of years. The good news is that in March, 2014 Councilwoman Joselyn Rich, Chairwoman of the Natural Resources Committee, announced that the Council had awarded a contract totaling $26,500 to Ocean and Coastal Consultants, Inc. of Gibbsboro, New Jersey, an engineering firm that specializes in guiding and designing solutions for these types of projects. Ocean and Coastal Consultants will develop alternative placement locations for future dredged material. We salute the Borough Council for addressing, in depth, this most difficult problem. We wish them well and much success. Chief Nummy will be pleased.